National Weather Service buying hollow point bullets? | Watts Up With That? National Weather Service buying hollow point bullets? UPDATE: Via Business Insider, my posit that this was a typo is confirmed. See below. At first I thought maybe this was for bear/elk protection of technicians when they go to service some of those remote weather stations in the Maine woods. The bid solicitation has the Marine Fisheries Service listed as the buyer. NOAA does have game wardens for commercial ocean fishing and game fishing, but why would they route it through the National Weather Service, which has no such programs? This is either a typo, or one of those convoluted government tree structures. UPDATE: Business Insider, who reported on the issue last night, has the story (h/t to WUWT reader Timothy Ray Erney). As I noted above, it was a typo. We talked to Scott Smullen, the Deputy Director of NOAA Communications & External Affairs who says the announcement is a mistake and is apparently being corrected at the time of this writing. Perhaps in response to the ‘climate wars’ heating up? Seriously, I can’t imagine what the NWS needs with any ammunition. Their security, where needed, should be carried out by specialized police forces. Yeah, I don’t get it. If they were shooting birds you wouldn’t use those bullets. My guess is that they have their own site security for different places – do you know which facilities they own in the towns mentioned? Department of Homeland Security in putting out a solicitation for 46,000 rounds of hollow point bullets. The DHS solicitation was much larger. 750 MILLION rounds following an earlier order for 450 MILLION rounds coming to over a billion rounds just this year. Why would DHS use that much ammo? Hollow points are not used for training. Much cheaper “wad cutters” are generally used for that. The chipmunks near the weather stations can be dangerous when provoked. Well, NOAA *is* one of the seven uniformed services. [Army, Navy, Air Force, Marine Corps, Coast Guard, US Public Health Service, and NOAA; as a kid, I used to argue that the Postal Service should be one, but Kevin Costner’s movie made that idea seem stupid. ], and its commissioned corps does operate it’s own aircraft and ships. Meh. 16,000 rounds? Sounds like a long weekend at the range. I would not want to use a .40 for a bear. .44 mag as a minimum. shotgun or rifle would be better. So if not for a bear what then? Because the terrorists Tea Party Patriots are expected to riot after stealing of the next election. That’s why the military is training riot control units for deployment in the US. And I’m an AGW climate skeptic but not a conspiracy nut. I have a funny feeling that my tax dollars are paying for a few NOAA guys to go plinking at the range on the weekends. Hollow points are the preferred self-defense round by both civilians and law enforcement, primarily because of their stopping power, and because the chances of overpenetration and subsequent harm to an innocent party are greatly reduced. The fact that they ordered hollow points is not noteworthy in and of itself. If purchased for target practice, though, it’s simply a waste of money (welcome to govt purchasing). FMJ (Full Metal Jacket) rounds are substantially cheaper. Though I support folks being armed, why the NOAA as an entity is arming employees is peculiar, especially with a strongly anti-gun administration. GUYS! THIS IS A NON-STORY! I am a former federal agent. NOAA, the National Oceanic and Atmosphere Administration has a SMALL (about 100) group of federal agents and officers who are GS-1811′s and GS-1801′s who enforce federal game laws on the high seas. They are ocean going federal game wardens enforcing the Lacy Act and the Magnison Conservation Act. It’s a great job. I personally know some of them and went to FLETC with one of them. They have been around since at least the mid-1980′s. Almost no one in the public domain and most of the people in federal law enforcement don’t know they exist BECAUSE THEY ARE SO SMALL. They carry .40 caliber handguns and have for many years. This is a routine ammo purchase. They are spending money they have left in their annual budget before the budget closes out at the end of September. Your reactions in your posts are understandable given that you didn’t have the facts! It isn’t. Click the “Solicitation and Buy Attachment” link for the full RFP listing. NWS handles the river gauge network that tracks river levels throughout the country. Some of those gauges are in rather remote wilderness locations and there might be dangerous animals around. Hollow-points are good against animals as well as people, so that MIGHT be the reason. But under those circumstances, a .308 would make a lot more sense. Would be good to have a bit more info – such as exactly WHO in the NWS needs this. Sounds like they’re having security problems. That’s really not very much ammunition, actually. Also, hollowpoints are desirable because they put the bad guy on the ground ASAP, with a minimum number of holes in him, while minimising the risk to bystanders. Given that they ordered ammunition, do they have the weapons that can fire it? Do some NWS folks carry forty caliber automatic pistols? Given that they ordered hollow points, maybe they are planning to hunt deer, boar, or some other large creature. So they’re getting ammo plus targets to train whomever with. Most of these facilities have light, although armed, security, and so this is likely for them. But it is very disturbing that they use HP rounds. I guess the Geneva Convection only applies to international wars… Internally, the government can be as nasty to its own citizens as it wants to be. HP’s are for killing…none of this triage BS with wounds that might heal from FMJ rounds…they’re just going to blow you apart, so that FEMA doesn’t have to “take care” of you. As noted, HP’s maximize the damage, and thus death count. This is like the lead-up to one of those B-grade sci-fi disaster movies – I’m thinking “Stonehenge Apocalypse”, “Solar Attack”, “Arctic Blast”, “Alien Incursion”, etc. Bears was my first thought too, but as noted, hollow points are the wrong item for bears (frankly I’d prefer a rifle, but a large caliber handgun would do). In particular, .40 JHP is common for police and carry enthusiasts. That’s a man-round, not an animal-round. Seems NOAA has like super cops ??? Revered by Ernest Hemingway and other anglers, Atlantic blue marlin is among the most sought-after fish in the sea. It’s also traded on the black market at levels that federal investigators can’t define. It is not “powerful” ammo – it’s very typical of police issue and self-defense ammo. It’s good for people-sized and smaller critters (like dogs), but not appropriate for bears. The write-up hyping “for maximum organ damage” is just hyperbole. The purpose of hollow-points it to ensure maximum expansion, to limit over-penetration, to maximize the chance of a one-hit stop: basically, you want to dump the bullets’ energy into the intended target, not the backstop (or bystanders). Having to shoot someone multiple times to stop them increases their chance of dieing, and you getting hurt. That’s why the police carry them. To non-shooters, 46k rounds sounds like a lot. Some top competitive shooters go through that much *per year, by themselves. * It’s less than a thousand rounds per week. So, if you need to train a bunch of non-shooters the basics of shooting and self-defense, it is really a fairly small purchase. The US civilian market is more than 10 BILLION rounds of manufactured ammo per year – heavy shooters often buy powder and bullets in bulk to load their own and save money. But, yah, WHY? The WEATHER SERVICE?! It’s not like the FedGov is flush with extra money to prep for a Zombie Apocalypse, and while some don’t like their station-sitings, it’s not like they need to be defended from a frontal assault. If their employees need self-defense stuff, let them exercise their 2nd amendment rights and arm themselves on their own dime. 1. They’re finally going to round up the climate deniers. 2. The federal government is paying off ammunitions suppliers who are donating to Obama’s election funds. 3. The Dept. of Homeland Security is putting in an order for thousands of weather stations and the Weather Service doesn’t like the competition. 4. What do they know that we don’t? 5. Who will defend the weather network if the Weather Service doesn’t? “NOAA has an enforcement section in national marine fisheries.NMFS…not the weather section. They are housed in the same place…read the acquisition contract and you will see the NMFS listed..Part of the enforcement is to keep foreign fishermen from raiding into US sanctuaries. Don’t be a conspiracy kook – it drags down those of us who are climate skeptics and want to be taken seriously. I stand corrected on the NOAA having a need for ammo – they apparently do have staff that are normally armed. This is a non-story. Other than possibly wasting money on expensive JHP for target practice. Thank you for providing a moment of mirth in what can be a crazy world! I’m picturing something from Monty Python’s “Holy Grail” – “That’s the most foul, cruel, and bad-tempered rodent you ever set eyes on!” Naturally, only a JHP round will suffice. Its probably just for their security guards. Its no big deal, that isn’t that much ammo if they are training with their firearms regularly which they should be. I’m looking for a good deal now on 5-10k .22lr. I can’t afford any .44-40 for my Winchester yellow boy. Forecasters are missing their targets so often, it was decided to get everyone into the ZEN of accurate pistol target shooting. They hope to be able to claim they are now “on target”, most of the time. They just won’t tell anybody… it is only pistol shooting. Anthony, you have been (justifiably) beating up the NWS for poorly sited stations and urging them to put more stations in more remote areas. As Aaron suggests above, that means more exposure to wildlife – bears in the north country, alligators in the south, etc. Given the budget cuts, I imagine that means the researchers will be maintaining the sites unattended or in very small groups. If the government is finally recognizing that people need the ability to provide for their own protection, well, that sounds like a step forward to me. Regarding caliber and bullet type – Sure, a rifle or even a shotgun would be better protection if you have it with you. Long arms, however, are clumsy and get in the way when you’re trying to carry two toolboxes and a stack of spare parts. It’s human nature – they’re going to get left in the truck. Maybe not the first day, maybe not the fifth. But after three months of lugging around a ten-pound piece of equipment that you’ve never used, having it snag on tree branches, fall off your shoulder at the worst possible times and generally getting in the way, there’s a huge temptation to leave it behind. That day of course will be the first day you need it. Pistols on the other hand fit in holsters and are easier to leave on than to take off. Even in the Army (where you’d think that the need to carry your rifle would be self-evident), it was a constant battle to keep soldiers prepared. A less-effective weapon that you have at hand is vastly more useful than the perfect weapon that’s too far away to help. They learned their lesson from the surfacestations project and are determined to keep volunteer data collectors away from their new, supposedly high-quality, temp collecting network? Can’t imagine what NOAA would have to fear from such disclosures becoming public. It’s not like there’s a tragic history to education pushing this transformative psychological and emotional emphasis. I also wrote today about the Systems Thinking push and how violating that is. That’s what the social sciences and education emphasis looks like in practice. I did not get to it but the Systems Thinking/Dynamic Modeling Conference for K-12 education is pushing classroom teachers to use modelling software coming out of Forrester and Meadows “Limits to Growth” work. More nonsense being pushed via education even though it has been factually discredited. Even the Club of Rome acknowledged it was over the top hype designed to push political change. But what teacher or student would know that? Paranoia is rampant in the current administration and there appears to be no moderating influence. You will find no statutory authority for the EPA, the DOE or NOAA being armed and having armed divisions for law enforcement and intervention, but they all do. Formally, investigation of crimes was left to the Federal agencies that are empowered by law for conviction. After all, they do have to “maintain the species” and hollow points will do the trick, but hollow points for target practice? Isn’t that a bit of waste of the tax-payers dollars? Anthony, It could be just that NWS funding was “borrowed” by NOAA though too. I eluded to this possibility and I still think this is the case….Why the destination in St. Pete? I can’t think of a good reason for that, but like I said before, something to watch nontheless, but probably just beauracratic mis-handling of something with funding is what it looks like. NWS had some money that the NOAA decided to steal. All money is fair game as they say in Government. Are so very appropriate here. I mean, you never know when those chipmunks are going to turn on ya. As an avid target-shooter (and re-loader) – and a firm & informed climate “denier” (so I’m on your side) I can assert that this is not really not that much ammo. I often shoot 500-1000 rounds at a sitting. More with company! Practice, practice, practice. Hence the re-loading hobby. The choice of hollow-points is semi-justifiable, but also a bit exorbitant. Welcome to Big Gov’t. As was said above, I humbly assert that this is really a bit of a non-story – the appearances notwithstanding. Oops. Delete first “not” in first sentence. That may have been true in the revolver days, but with a modern semiauto handgun you want to make sure your weapon will cycle your self defense ammo, so agencies usually train with their carry ammo. Me, I’m not so fortunate as to have Uncle Sugar pay for my ammunition, so I do train with lower power FMJ “Winchester White Box” target ammo, and finish off with just a few of my carry loads. I guess none of you folks is aware of Wardens coming under fire. Isn’t it a good idea to train with the exact ammo you will be using? The National Weather Service desires to purchase 46,000 rounds of .40 S&W jacketed hollow point (JHP) bullets. [NB– this number was derived by adding those in three separate solicitations by the General Services Administration on behalf of the NWS for 16,000 rounds, 24,000 rounds and 6,000 rounds respectively, to be purchased along with 500 paper targets (the subject of a separate solicitation) and shipped to various addresses in Maine, Massachusetts, Florida and New Jersey.] Here is the link for the solicitation. The .40 S&W jacketed hollow point (JHP) bullets are, according to the re-bloged article, “noted for their strength.” According to an article in Business Insider, also noting the solicitations, hollow point bullets are designed to expand when they enter the body, causing as much damage as possible to internal organs and tissue. They’ve been illegal in international warfare since 1899. Assuming that the National Weather Service proposes to use the desired hollow point bullets to combat the Demon Global Warming, the solicitation makes sense. The Global Warming Demon is too big and too powerful to kill with carbon exchanges, human sacrifices atop Mt. Gore or apparently even with ordinary ammunition. The big question is, shouldn’t the NWS be seeking Krypton cased bullets because the GW Demon has Superman-like capabilities? What else could the NWS intend to use them for? Target practice? Assuming that the 46,000 bullets hit the 500 targets, that’s ninety-two bullets per target. If I tried to hit such a paper target by firing my BB air pistol at it at five paces, there would be little left of the target after the first couple of dozen shots. And I am one of the world’s record-holding worst shots. Kinda makes a fella wonder. So the government can show an up-tick in ammo purchases in the United States; both in number of rounds and number of ‘end users’ . There will be no breakdown of either on the graphic in the press release. As a bonus the graphic will show a tendancy trendint to hollow point. Wait for the nylon/kevlar/teflon point governmant agency purchases to start, that press release graph would make for a ‘alarming’ trend. Where the buyer is listed as National Marine Fisheries Service. True enough, but what happens when the “innocent party” is the target? Not generally – other than making sure that your firearm properly feeds the JHP brand that you plan on using, for training, use what’s reliable and cheapest. The difference between JHP and FMJ is negligible for training purposes. Wad cutters are for the firing range, not plinking. Like others mentioned this is NOT what you think. The bid is through NWS bid process, but is specifically for the National Marine Fisheries Service. NMFS does have a law enforcement function. If as they say they are trying to spend their budget for the year I have to ask WHY? It is tax payers money wouldn’t it be nice if you didn’t spend your budget and sent the remainder back to the treasury so the national debt did not grow quite so fast. What others have said. Hollow-points are considerably more expensive than copper-jacketed. Normally HP is used for self-defense since it won’t easily pass through whatever you’re shooting at and hurt a bystander. I use about 120 rounds of HP a year just to keep fresh ammo loaded. I also usually shoot out about 300-900 rounds of FMJ a years just to keep in practice. As far as I know, this is about normal for the average citizens who carry. Some shoot a lot more, but those that shoot less probably shouldn’t carry at all. I would expect law enforcemnet officers to practice more, but not with HP. Well I’m betting the Polar Bear population will be taking another dive in the near future, further proof of global warming. Practice with what you intend to carry/shoot. This isn’t a story to worry about. The real story to worry about is why the DHS needs 450 million pistol and 200 million+ 5.56 rifle rounds. Higher ammo prices related to shortages brought on by the war efforts and by the massive stockpiling by US citizens following the 2008 elections had eased for awhile in 2011 and early 2012, but are heading skyward, again. .223 rounds (AR-15) at one of the nation’s leading discounters were $300/1000 rds. with free shipping early this year, but are now $350/1000 rds. + shipping, a nearly 25% increase. This was a mistake by the original publication. The NWS had nothing to do with the purchase. It was entirely for the NOAA Nat’l Fisheries Service Office of Law Enforcement. I’m not sure how that got screwed up. Getting ready for the planned coup.. Working on a smaller screen here and somehow missed the last bit in the original post above to the Fisheries doc and posted it here only to see it not show up: THANKS to the moderator for catching that. (Blush.) It does reasonably point to your statement about the ‘convoluted government tree structures’ and in that context makes the purchase plausible. Focus on the title: National Weather Service Follows DHS In Huge Ammo Purchase!! The NWS is following the DHS but we don’t know why the billion rounds are being purchased and who is intended to use them. Does anybody know about planned or even unplanned civil unrest…I don’t!! Seems rather paranoid at the very least, but certainly should be monitored. As hollow point is more expensive than standard ammo, I still don’t understand why they would use that ammo for training unless it is a safety issue (less likely to penetrate body armor). I’m going along with those thinking the ammo and pistols are for guards at the new surface stations to keep anyone trying to monitor those stations away. Of course the purchases could be for those personnel who indulge in practical pistol competition, and those personnel were hoping the purchase would fly under the radar. Or it could be for the killer chipmunks. This way, they can justify their large budget requests for next fiscal year. If they have budget overruns, then there is concern that asking for a 10% increase is excessive. But, if they spend all of their budget and then some, then asking for an increase next year is just common practice. Also, do not forget that the Dept of Education recently purchased Assault Shotguns and Body Armor. But then, we do know that the Dept of Education does visit you with a SWAT-like team of happy gun-toters when you appear to be late with your payments. Anthony, look at the delivery addresses NMFS OLE is National Marine Fisheries Service Office of Law Enforcement. Paranoid much around here? It may not have the mission, but it may have the funds and it would be easier for them to spend the money and hand over the ammo then get the money reappropriated or transfered. Of course if NWS has any money it can’t spend maybe it should upgrade some weather stations rather than buying ammo for another division of NOAA that is short on ammo and funds. According to my Canuck friends, anyone who uses a pistol round on a bear had better file down the foresight and grease the slide…. Probably to beat off attacks by environmentalists after the NWS stops supporting the idea of CAGW…. Though I do have to admit it is a bit odd at least, that of the 4 places ordering the bullets, St Pettersburg (as mentioned above as near the site of the RNC) is the only one not ordering paper targets, but it is getting the most bullets. Hopefully that is just tin foil hat stuff though. About hollow point ammunition, when I took the concealed carry course in Texas, we were advised to use hollow point ammunition for self-defense. Preferably use the same type that the police carry. Winchester, for example, has “Ranger Law Enforcement Ammunition.” A hollow point is much less likely to pass through a bad guy (or walls) and hurt a good guy. As an added benefit, it does have more stopping power. When a citizen or a police officer is forced to use his weapon, the purpose is to stop a bad guy before he can harm you or someone else. Probably the other agencies already exceeded their allocation; NWS has no allocation number filled, so they can buy as much as they want. Are the paper targets weather maps — they’re likely to get the same results with darts which aren’t as noisy. Media Clips – Alex Jones: Con-spir-acy Victim or Evil Mastermind? There’s nothing strange about jacketed hollow point ammo. It’s perfect against fleshy targets and is less likely to over penetrate (bodies, dry way, etc.) Unless you’re shooting at body armor or through vehicles or stuff, hollow point is valid. Hollow point is considered humane against soft flesh targets. Less wounding – more killing. People are silly when they get “concerned” about one round or another. A gun is simply a tool to bring about death from a distance. Pick the ammo best suited for the job. A hollow point ain’t no different than a FMJ, ’cause both have their valid uses. They were both engineered to kill. Either use the \sarc tag or be prepared to substantiate your irrational comment. I’ve been to several different Taxed Enough Already (TEA) rallies and meetings. I have seen no tendencies to violence, prejudice, or even impoliteness from TEA members. NONE. This includes a TEA rally on the WA state capitol steps, with more than 3,500 WA residents from all races and walks of life being confronted by swearing, insulting, and violence threatening union thugs that had been bussed in. All of the TEA attendees remained civil and temperate, despite the gutter low affronts, intimidation, and attacks from the opposition. That’s not the ideology of a ‘terrorist’, now is it? They summarize the core values of the patriots that made the United States of America a truly great nation. Those are the core values of the TEA Party Patriots today. Consistent with the Dept. of Education’s purchase of shotguns and assault weapons for SWAT teams. They would be better advised to invest in white flags. The National Weather Service listed as the requesting agency was nothing more than a clerical error. The ammo and targets are for the National Marine Fisheries Service, Office of Law Enforcement, Northeast Division. Business Insider has an article that explains the request and clerical error. Yes, ideally one would use the same ammo for target practice as they would carry on duty, especially with semi-auto pistols. Anthony, I’m disappointed that you’ve been fooled by a ridiculous conspiracy site like Infowars without doing your own research to confirm or deny the allegations. I thought you were better than those Alex Jones conspiratards. Non-story. I am guessing this happens all the time. I suppose that Social Security offices provide ammo for their security staff. I can also imagine that when one budget column gets used up, other columns are used, even crossing into other sub-departments to fund another department’s need. Happens in education all the time. We have several columns for money coming in from a variety of sources. These sources like to know what was spent so we have to keep them separate. However, when the rules allow it, we can use one column to pay for another that has run out of money. And I second that less than a thousand rounds per week is pretty mild. I keep varmit populations in check at the family ranch. And I shoot at paper and metal targets for fun. This year I hope to bag my first deer, elk, and bear. Heck, my habit of using a goodly amount of ammo is even recorded on the web in the range report of the last .22 shoot I attended. I was using my Marlin rifle at 500 yds. It took a few rounds to make the metal ring that far away. And I managed to do it a satisfactory number of times. However, I need to mention that a young boy got it on his first shot. I think this is easily explained by a screw-up on the FBO page. 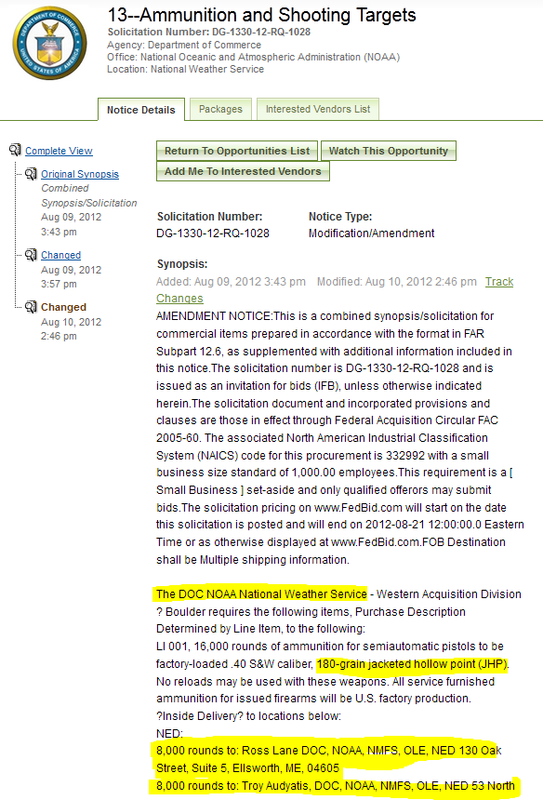 There is no “Western Acquisition Division” within the National Weather Service, but there is one within NOAA. That office appear to handle contracting for multiple NOAA agencies, including NWS and NMFS. The ammo is obviously being shipped to various law enforcement offices at NMFS if one reads the entire FBO notice. I was able to deduce all of this with about five minutes on Google. Too bad Matt Drudge and Alex Jones don’t have similar skills, but that wouldn’t get them any eyeballs and ad clicks. Regarding JHPs, they’re less likely to ricochet as a solid body off metal surfaces and become a danger to the shooter or those not targeted. That’s generally a benefit to an LEO. Thousands of rounds is not that much. The media would like you to believe otherwise, but it simply is not. Walmart sells boxes with up to 500 rounds and a single target shooter can easily go through 500 rounds in a few hours. Ammo is commonly sold in 1000 round cases. Even larger. Sportmen in the US shoot many billions of rounds in a year. The reply from NOAA Communications is disinformation. They got caught. You can believe it’s just stupid mistakes by a bureaucrat if you like but expect to be surprised later when you find out the truth. True, when I first heard this story, the numbers did not seem that great. Heck the number of rounds in one purchase looked like my monthly ammo usage. There was a time when even *FBI* agents were *not armed* in the execution of their duties and had to ask a local officer to arrest someone when it needed to be done. I suggest that we return to that model. There are at least *90* federal agency that are armed. Including the Department of Education. And people wonder why they hear complaints about the US becoming a police state. There is far to much power in our federal government that was never intended by the founding generation. Return the power to the states, and we won’t have a problem. This may be routine for you, but NWS apparently has gotten away with it in the past without the public noticing. The internet has changed that. Public officials haven’t gotten used to the attention and constantly cry “this is routine!” Well, the gig’s up. We’re onto you, now, and after a few more election cycles, expect to see the dismantling of the federal government institutions you hold so dear, institutions the founding generation would not countenance. Vince Cefalu comes to mind. He’s brave in the sense that he has exposed corruption in the ATF and been an outspoken critic of Operation Fast and Furious. But in one interview he call the ATF “the Agency I love” that performs an “important and necessary function.” Made me wanna puke. Similar to this. The Lacey act needs to go and the NWS should *not* be armed on the job. Ever. It certainly is not hard to separate those who know what they are talking about when the subject is firearms and those who don’t in these comments. My favorite comment however was Bob Tisdale’s. It is scary thinking about what could happen if the squirrels of the world decided to go after a new source of nuts. Why target practice with hollow point, rather than wad cutters? 16,000 rounds for 63 officers isn’t enough for 5 rounds per officer per week. Not exactly a generous ammunition allowance for training. Pretty much any semi-competitive shooter will use far more than that allowance. Regarding JHP vs FMJ, what about the costs of procurement and allocating seperate practice/qualification and carry ammunition? Also given the high price of copper, whether FMJ’s really are much cheaper now. It’s a good idea to train. Learn the skills to get on the target, then to hit where you want to on the target. If you’re using a proper hold, aiming center of mass, and you’re worried that different ammo will make the bullet go too high or low and you’ll miss, you’re too far away for a handgun IMO. When using different bullet styles, match the bullet weight very closely and the muzzle velocity reasonably closely. Then you’re matching the amount of recoil so the different ammo will “feel” the same. For semi-automatics it’s a check on reliable functioning, as they need a minimum of recoil to operate but too much causes battering of surfaces and possible malfunction. With those matched, the starting part of the projectile trajectory should be matched. Different bullet shapes will affect the ending part of the trajectory, as different amounts of energy will be lost, resulting in different amounts of bullet “drop”. Again, if you’re far enough away that you’re worried about that, you’re too far away for a handgun. Mainly because it’s harder to get the horizontal positioning right at those distances. On a human-like target, if you aim for center of mass, like the bottom of the rib cage, and hit the shoulder or the leg instead, it’s still a disabling hit. That amount of difference right or left means a miss instead. My experience may be limited, but I have found and read many times how it’s easier to screw up sideways. When you are “elite” enough that you want to and expect to make headshots consistently, then worry about using the same ammo always. As hollow point 40 cal bullets (for reloading) cost the same as full copper jacket (FMJ), it would be reasonable to order rounds that could be used i practice and in the field. With reloads, one always has to have some factory rounds for guns to be used in self-defense, as reloads cause litigious conditions, claiming that one put more or less powder in the round in order to inflict more pain and suffering. As reloads quite often are not as powerful as the factory rounds, practice with the real ones would be more directly worthwhile. One shooter pointed out that frangible bullets are so light that you have to adjust your shooting habits, or you end up shooting low. When first learning how to reload, I backed off on the 357 magnum loads such that I basically had a 38 Special round. Arctic ICE PANIC sparked by half-baked sat data! Some of the comments here are obviously from people who don’t know squat about ammo. JHP is primarily for use against people. Hunters typically don’t use JHP because it doesn’t penetrate deep enough for a quick kill against large game. For boars, bears, etc. you need a hard cast solid lead slug or a large caliber rifle round that will go thru at least 8″ of hide, muscle, and bone without breaking up into small pieces within the first couple inches of penetration. You shoot a medium size boar or a bear with a measly .40 JHP and all you’re going to do is piss them off. I hunt boar with a Ruger .41 magnum using a 230 grain hardcast bullet, and even then you better hit the right spot. A .40cal JHP round hits with less than 400ft/lbs at 50 yds. My Ruger hits with over 1000ft/lbs. Clearly the NSW seeks maximum stopping power when dealing with CAGW climate skeptics. I can only say that the Hornady Critical Defense 9mm Luger JHP I bought retail at Academy last week to replace what I shot up was $21.99 for 25 rounds. The Remington 9mm 115 gr JHP was also $21.99, but for 50 rounds. On-line might be cheaper. I quit buying ammo at Walmart when they quit selling handguns. CORRECTION: The Remington 9mm was Full Metal Jacket, not JHP. “Shooting fish in a barrel” might be their next convention activity. I believe if you look into it you’ll find that virtually all federal armed agents carry the .40 S&W as their standard sidearm (FBI, CIA, DEA, ICE, Federal Marshals, etc.). It’s a matter of standardization. Most police officers carry .40 S&W these days as well. I haven’t seen a cop with a revolver in probably 20 years (and it was a .41 Magnum). I don’t remember how long ago it was…maybe 3 decades ago…..most of the FBI carried the venerable 9mm. The 9mm is an amazing round in terms of energy, velocity, relatively mild recoil, and extremely efficient use of materials (i.e. brass and lead). Both the 9mm and the .45 ACP were developed over 100 years ago. They were both designed as man killers and not for hunting. There were two schools of thought at the time. The 9mm sent a smaller, lighter projectile downrange at greater velocity with high penetration. It also allowed greater magazine capacity. On the other hand, the .45 ACP delivered a larger, much heavier, slower round downrange with far more kinetic energy (i.e. “knock down” power). But it is also associated with a more robust recoil.. John Browning was onto to something when developed the .45 ACP. Most handgun engagement occur at a range of less than 30 yards. If you hit a human in the shoulder with a .45 ACP they WILL fall down. A 9mm might just pass through without disabling the “bad guy.” The US military still issued the .45 ACP 1911 pistol until just about 20 years ago or so and then switched to the newer, more potent, lighter 9mm with far greater magazine capacity and lighter recoil. Target reacquisition after the first shot it critical in a gun fight. The FBI commissioned the development of a new round to replace the 9mm for their agents. There were a couple of incidents where they shot and hit perps who didn’t fall down but kept shooting back. They decided they needed more knock down power in a semi-auto. Actually a .357 magnum revolver would have done the trick but they’re a bit bulkier, have more recoil and have to be reloaded after 6 shots. The 10mm auto and the .45 ACP had too much recoil for smaller agents and many female agents. Two new rounds were developed, the .40 S&W and one other I can’t recall (.41 action express?). In the end the .40 S&W won out. I reload both 9mm and .40 S&W. The ..40 S&W is basically a slightly beefed 9mm. Case dimensions are virtually the same except the 40 is 1mm wider. It performs much like the time tested 9mm except it sends a significantly heavier projectile downrange faster than a .45 ACP but slower than a 9mm. It’s only slightly larger and heaver than a 9mm and the recoil is only moderately greater. It delivers more kinetic energy on target and can be loaded in high capacity magazines. Soon just about every armed federal agency had switched over to the .40 S&W (as has a lot of law enforcement). But the .40 S&W remains a man killer. It is completely unacceptable for game. It’s a personal defense law enforcement round. I load and reload my own ammo with Hornady JHP (XTP) to medium to high charges. When I practice, I shoot the same round as I would carry. It has to do with muscle memory. When I go plinking I shoot the cheap stuff. think a lot of cops (who don’t buy their own ammo) also train with what they carry.on duty.. So huge government orders of one particular round is not too surprising, nor is it that they ordered .40 S&W. That it would go to the NWS is the big question. But hell, it seems like every bureaucrat wants to be armed these days (the IRS, the Dept of Education, etc.). I have not been able to afford to buy my preferred self-defense ammo, Federal EFMJ .40 for the government demands on production facilities has driven the cost to levels once seen for .50 BMG. Purposeful or not, gun control through the economies of ammunition is effectively reducing citizens’ supplies. Good people ought to be armed as they will, with wits and Guns and the Truth. Infowars is a notoriously unreliable source. It and PrisonPlanet are the web sites of Alex Jones, who gives lunatics a bad name. Jones “thinks” (I use the word loosely) that secret conspiracies or space aliens are “the world’s controllers.” He says the government is intentionally poisoning you with vaccines and fluoride to keep you docile. Here Jones tells his radio audience what he thinks of American conservatives, and here he is in action, abusing Michelle Malkin, who is the petite lady in the video. I also have attended a couple of Taxed Enough Already “Peacable Assemblies”; the earliest ones held on April 15 TAX days, and a more polyglot friendly bunch of calm rational people of ALL ages, and ALL ethnicities, and ALL social and economic strata, and ALL collar colors, one could never hope to meet. Courteous, and sober, and harming NO person or property, co-operating fully with local law officers (who got bored to tears, having to stand there as if somebody expected they would be needed). And leaving the meeting place a darn side cleaner and tidier, than before the event. The blatant stupidity of TEA party critics, is their own undoing; because THEY themselves confess their ignorance, since if they had EVER attended a TEA party rally, they simply couldn’t say any of the dumb things they write and spout; well not with a straight face anyway. Re: .40 cal not so good for bears… true…, but significantly better than bells. Btw, in case nobody has noticed, there’s a lot of very big cons, and druggies running around loose who make a habit of wearing kevlar. A .40 won’t even tickle them. This pistol and ammo will be around for quite a while. Maybe they read Anthony et al’s paper and are going to put all those bad stations out of their misery? Hah! loved that comment, now just need the Josh cartoon to follow!! The comments about not stocking multiple types of ammo are (you should excuse the expression) dead on. What makes sense for an individual to do in switching between FMJ and HP does not necessarily make sense for govt procurement, inventory tracking, issuing, etc. Moreover govt personnel get much less range time than private shooters, so authentic muscle memory with the carry ammo is really critical to make their limited training time valuable. I also train sometimes with HP, because I don’t get to train as often as I’d like and if I ever need to self-defend I intend to be *effective* at it, despite being a 60 yr old woman. Comments about numbers of targets vs. rounds ammo don’t take into account the likelihood that they have targets in stock and are just topping up – not to mention that the ammo being purchased might be for carry rather than for practice. Really, guys ….. They are going to shoot anybody who takes a photo of a weather station. As long as you take the 46,001 th photo you will survive. Thanks Anthony – if not a typo – maybe a possible preparation for upcoming super solar storm/grid failure ? Actually, based on conversations with some law enforcement folks I know, only in Hollywood does body armor allow someone to take a hit and barely notice. In reality, even a 9mm hit is likely to break a rib. Taking a hit on your armor is similar to being hit with a baseball bat – about 350 pounds of force if I remember the number correctly. A case of “Shoot the Messenger”. RE: getting shot – I recall a certain shootout in LA a few years ago, in which a couple bad guys took several shots and kept on ticking and shooting back. I believe they had doubled up on the kevlar; but in any event you can put a bullet in a man’s heart and if he’s in reasonably good physical condition and/or pumped up on adrenaline, pcp, meth, or any of a dozen designer drugs, he’ll still be functional enough to kill you for about 15 seconds. A very long time in a gunfight (take it from a retired combat Marine). That is one of the reasons the 1911 .45 was developed. The .38’s used in the Philippines insurrection at the start of the last century were not stopping the natives. Something powerful enough to knock a big man down was required. A 38, 9mm, or .40 just won’t do that. … more Kim Dotcoms … ? If true, then based on shootings and autopsies the 9mm was a failure. The .45 ACP is known as 1-shot man stopper, the 9mm is not. Paraphrasing: When a man with a 9mm meets a man with a .45, the man with a 9mm will be ‘the’ dead man. I have a Marlin lever action .35 Remington. The tube uses either round nose or sharp rubber tip bullets. The round nose are cheap, the rubber tips expensive. However, if I want to target in my gun in any way that is accurate for when I need it to be accurate, I use the expensive rounds. Yes it seems a waste of ammo, but if I want a kill shot instead of a wounded animal hiding in the bushes, I’ll use the expensive ammo to target in my rifle. Our government is becoming dangerous to its citizens. Something has changed recently. Hey Pamela Gray, glad to hear you are going for your first big game animals . The hunting in your part of the state is fantastic and my wife and I plan to be there again this year as we’ve drawn tags . I hope you score on all three , my wife has many times taken dear elk and bear and handles her own animals and carries a heavy load of meat . She is a petite 120 lbs. and a deadly shot so I,m sure you can do it . In my experience where you are most deer kills are in the 100 to 200 yard range and most elk in the 300 plus . Your .35 will do the job as long as you point it right . My wife once took a four by deer at 400 yards but that isn’t her common kill range. And she has bagged more elk than I have. She has had better luck in the tag drawing. And no I don’t shoot her game for her. If I did that I would have to learn how to cook 🙂 . Good Hunting ! I keep a loaded pump shotgun (& bandolier of shells) at the homestead with first shell having no shot in it – just gunpowder for my 1st bark, or as my strategic secret in case someone else manages to get hold of it. So ammunition banned by the Geneva Convention is OK for US Federal agencies for use against their own population, who else is it for use against? Or perhaps they are fed up with Hansen are on the war path. Its not so much about conventions, as the measured application of force. A major mandated issue for the LEO in an urban firefight is where the misses go. A frangible bullet gives a little satisfaction that you might not take out 3 kids in two apartments as well, as well as having the effect of bringing the issue to a close more quickly. With regard to conventions, in “traditional” battlefield war, casualties are a given. A military hardpoint will either kill you or incapacitate you, while the HP makes a mess to treat (yeah, yeah). In the urban fight, the perp has the option of not escalating in the first place – engaging in a firefight is not his sworn duty. So, choices as to the outcome. One last comment re: who is actually getting this stuff. Often one government office will be assigned procurement responsibility for other offices within an overall federal agency. This is done to (gasp) prevent duplication of staff etc. So don’t try to read meaning into which office is listed in the procurement announcement. It may or may not have anything to do with who actually uses it or whose budget within the agency pays for it. Before y’all go off half-cocked (pun intended) it’s worth asking calm questions about such things. The interesting thing in this article are the words “although scientists are sceptical. ” in a BBC report. Hmmmm…makes me want to find an EPA, Secret Service, or Capitol Policeman to sit near next time we go to the movies. OK, as we continue our looking through Federal Bids, we see in June the Secret Service was shopping for “40,000 rounds with two options for 20,000 rounds” of Winchester .300 Magnums. Awarded to an outfit in Rapid City June 30, if we’re reading it and all to be delivered before year end. Urgent Update: 600,000 Rounds to Capitol Police! I’ll go with those commenters with shooting experience: training, practice and qualification ammunition for those fisheries officers who carry. The paper target order sort of gives it away. No one has indicated how much time this buy is for, but it really doesn’t sound like much ammunition. Train with what you carry. Hollow points are pretty much the standard law enforcement and defense rounds. Heck, I’ve been shooting .22 hollow points for almost 50 years and hollow points in other calibers for almost as long. This is a non-story. You don’t shoot fish with Hollow points. You don’t shoot fish period. “I love you’re ‘Nothing to see here'” response, it’s exactly what the government wants you to think! Why cite FAR 6.302-2 for “unusual and compelling urgency”, and the delivery time requirements? I’ve sent tens of thousands of rounds downrange and I’ve yet to see anyone in the Metro Toronto Police range or the RCMP at Regina Depot’s ranges (the big training center midwest) using hollow points as they cost literally twice if not thrice standard shot. Come to think of it, I’ve seen hp rounds at CFB Winnipeg and CFB Borden though. You Americans sure like to spend when you don’t have to Anthony. Scientists sceptical? But the model clearly shows Russia’s inner city squirrels are gang-centric. The problem started in the 1970’s. Incarceration is a business model. It keeps taxpayers paying money. It keeps people employed. It keeps criminals off the streets, and politicians can’t not keep promising to lock up baddies. Nothing the clerical error, still begs the question why the Fisheries Service needs Hollow-Point bullets? Do the quota officers really face off against alot of heavily armed boat captains? I really get a kick out of the comments here that suggest that hollow-points are good for bear, boar, and other dangerous animals. Hollow-points are DEFINITELY NOT good for that purpose. For dangerous animals, you need penetration – bone-busting penetration. Also, .40 caliber is most definitely not a good caliber for use on dangerous animals. .40 caliber hollow-point ammunition is made and intended for only one purpose – shooting humans. In bear or boar if you are carrying a handgun for protection, you need at least a .44 magnum. .454 Casull or .500 S&W are better. But .40 caliber? Not on your life. Hollow-points, no way. Hollow-points are also not generally used for target shooting except when practicing with the self-defense rounds you will be using. So, folks, the ammuntion in question is intended for shooting human targets. Bob, Nobody that I know practices with hollow-points except to zero in for the ammo they will be using on duty. It’s not only much more expensive but it’s simply a waste. Your use of .22 hollow-points is a terrible comparison. They are cheap. But good hollow-point self-defense ammo in .40 can cost $20 for 20 rounds – a buck a shot! You don’t practice with ammo like that much. Well, unless you are the government and like to waste taxpayer money, of course. I’d like to know how the other agencies in the Gov’t get away with lead ammo, when the military and civilian shooters have been repeatedly castigated by environmentalist’s and the EPA for poisoning various spotted and non-spotted wildlife with the very same ammo. Fair is fair. Now Social Security Administration is confirmed buying 174,000 rounds of .357 Sig hollow point rounds. You just almost have to feel sorry for someone who doesn’t appreciate a fine .45 acp auto. Examine ballistics for the 9mm and .45 acp and find that the .45 retains almost as much energy at 100 yards as the 9mm has at the muzzle (comparing both heavy or light bullet weights in each caliber) and you will see why the US Marine Corps and various Special Ops Groups have all gone back to the venerable .45 acp. in re: .45Colt- there is nothing about the original black powder .45 Colt load which could label the round a “slouch”, as it was designed to “shoot through a horse” (sorry, horse lovers, but wars back then were fought with mounted cavalry). There are any number of loads with modern powders which exceed the original ballistics while remaining at safe operating pressures of 14K psi, safe enough for Colt SAA and clones. One powder mfg. even lists load data of 1129 fps w/ Hornady’s 250 gr. XTP… safe and potent. .45 Colt loads with 260 gr. cast bullets @ 900fps (close to old black powder load) are known to shoot lengthwise through a mule deer at 100 yards. What a fun thread. Can you tell I like .45’s in all the various flavors? Nobody is seriously suggesting bear hunting with a .40S&W. In fact, up here, nobody seriously suggests bear hunting with any pistol, even if it were legal, which its not. But if the situation warranted, I’d probably do more with the .40 then just throw it at him, even if the outcome doesn’t change much. Apparently, when all is said and done, the total amount of various kinds of bullets being purchased by non-military agencies is more than 1 billion. And some agencies have set it so that their purchases are recurring annually. Why does the TSA need hundreds of millions of hollow point bullets? Especially with no money available to the government for these large purchases, and with the military cuts that are taking place? Why cut the military and then heavily arm other government agencies?? Bullets for the Social Security Admin. is bizarre to me. And why .357 hollow points? I also ask, what is going on? Sorry, that’s a common misconception. It was actually the Hague Convention (aka Hague Accords) of 1899. Even Wikipedia has it right in their Expanding bullet entry, which is a good read for the history and current application of the prohibition. Until relatively recently, the prohibition on the use of expanding bullets was only applicable to international armed conflicts. The International Committee of the Red Cross’s customary international law study contends that customary law now prohibits their use in armed conflicts not of an international character. The adoption of an amendment to Article 8 at the Review Conference of the Rome Statute in Kampala makes the use of expanding bullets in non-international armed conflict a war crime. Because the Hague convention applies only to the use of expanding bullets in war, the use of expanding rounds remains legal, or even required, in some circumstances. Examples of this are use of appropriately expanding bullets in hunting, where it is desirable to stop the animal quickly either to prevent loss of a game animal, or ensure a humane death of vermin, and in law enforcement or self defence, where quickly neutralizing an aggressor may be needed to prevent further loss of life, or where the bullet must remain inside the target to prevent collateral damage e.g. on an aircraft. So governments are allowed to use expanding bullets against their own citizens, except in the case of armed insurrection (revolution) which would be non-international armed conflict? Of course I find the whole issue horribly outdated. We can bomb enemy positions flat, employ missiles, mortars, and grenades to annihilate mass quantities at will. But expanding bullets are banned as too messy and lethal? In the models of “civilized” warfare, non-expanding bullets results in loading down the enemy with wounded, draining their resources. Nowadays we face enemies who leave their wounded for we to tend to, with the occasional booby-trap added, when the injured fighter isn’t conscious enough to wait with a grenade or other weapon for our medics to approach. What purpose does this prohibition serve in modern times? Guess they have to protect that lockbox! If I’m not mistaken, HP and similar rounds were banned in warfare in response to the British in one of it’s colonial wars (Indian Thugees?) flattening or cutting off the tips of their rounds to cause for damage. Such rounds were called “dum dums”. It was dum dums that were originally banned. Along with the military, for the most part, being prohibit by the Posse Comitatus Act from being used / acting inside U.S. against U.S. citizens; whereas Big-Brother agencies are all to willing. Amino Acids in Meteorites: “Why cut the military and then heavily arm other government agencies? ?” Likely answer straight from the horses mouth: http://www.youtube.com/watch?v=Tt2yGzHfy7s Along with the military, for the most part, being prohibit by the Posse Comitatus Act from being used / acting inside U.S. against U.S. citizens; whereas Big-Brother agencies are all to willing. I believe that changed with the passage of the NDAA. Well, after looking I see ObamaCare does allocate money for a domestic military for that answers to the President alone. Oh really? So they only use organ destroying bullets for shooting at those paper targets , right? I though dum-dum rounds were forbidden by the Geneva Conventions governing wars. I guess the gloves really come off when it comes to protecting FISH though. The first British “Dum Dums” were produced in the early 1890’s after the adoption of the .303 inch Lee-Metford rifle with its smokeless, jacketed round. Compared to the .455 and .577 inch soft lead bullets of the Martini-Henry and Enfield-Snider this round lacked stopping power. Always happy to help its troops, The Indian Army arsenal at Dum-dum (hence the name) produced a round with the jacket stripped away from the tip. It was found that sometimes the jacket spalled off and got left in the barrel. Another round was designed with a hollow point as a solution. Following objections by the Germans these were banned by the Haig convention of 1899. The USA had no objections at the time as they had just shipped large quantities of expanding bullets for use in the Phillipines. None of the .303 “Dum Dum” designs did anything like the damage of its large calibre predecessors. The Thuggee gangs were suppressed by fairly standard police activity conducted by Colonel William Sleeman between 1830 and 1850. It wasn’t a war as such. well we wouldn’t want those in other places to say that on WUWT “they were too dumb to know about the dum-dum” :-)…. 46,000 rounds for 63 people is only 730 rounds apiece. ‘Course that’s rounded down. There’d be ten rounds left over. Who gets the extras? Can’t divide them into 0.15873015873015873015873015873 round pieces.